In the past, our Technical Director, Hector Diaz, and his father have been responsible for helping develop many soccer players that have gone to play for our Youth National Teams, professionally and at the University level. No one in the South Bay could hold such accolades, other this pair. In 2009, Hector Diaz Jr. made a switch from their former club, onto Chula Vista FC, in the intent to structure a club that could continually produce such players in the South Bay instead of doing it with just one team. Their success currently with the First Team (an adult team) in winning the CalSouth Adult State Cup 2018, has flowed onto there youth side as well. 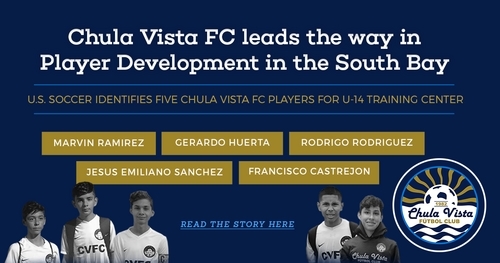 Chula Vista FC's Boys 2004 were the first team to play in the Development Academy season. They too have benefited from the recent success, as five players from that age group recently were called for a Regional Training Center with the U.S. Youth National Team staff. Chula Vista FC represented San Diego County with the most players called up to the camp. The boys credited the call up into the camp with four simple words: humble, hard working, dedication, and training. Congraulations to Marvin Ramirez, Rodrigo Rodriguez, Jesus Emiliano Sanchez, Gerardo Huerta, and Francisco Castrejon!